Wizzscreenmode is promoted as a free Desktop widget that allows modifying your screen mode, adjusting brightness and other settings. Wizzlabs is the creator of this program, and it was found to have created many other suspicious apps, including WizzAppChecker ($39.99) and WizzWiFiHotspot ($9.99), that we classify as advertising-supported software (adware). All of these applications appear to provide users with beneficial services, but our researchers have found that they can inject advertisements, which is always risky. Furthermore, the legal information supporting this adware is quite suspicious. If you want to learn what we have found while analyzing this ad-supported program, please continue reading. If you are sure you know everything there is to know, you can move to the last portion of this article to learn how to remove Wizzscreenmode. According to our researchers, Wizzscreenmode does not work very well. It is possible that this program is underdeveloped, but it is also possible that its main function is to show ads, and its functionality as a Desktop widget is a secondary worry for its developer. The truth is that the more ads this program shows, the more ads you are likely to click on, and this is what generates a profit. No money will be made by providing you with a free widget, but advertising ensures a steady flow of money as long as there are parties willing to use an unfamiliar program to promote their products or services. Do you think reliable parties will use the this suspicious app as an advertising platform? Although this is possible, it is more likely that this program will support parties that cannot use legitimate advertising sources. If you are not sure if you can trust the parties hiding behind the ads that Wizzscreenmode injects, it is best to remove this advertising-supported program from your computer. According to our research, Wizzscreenmode is also spread via software bundles. 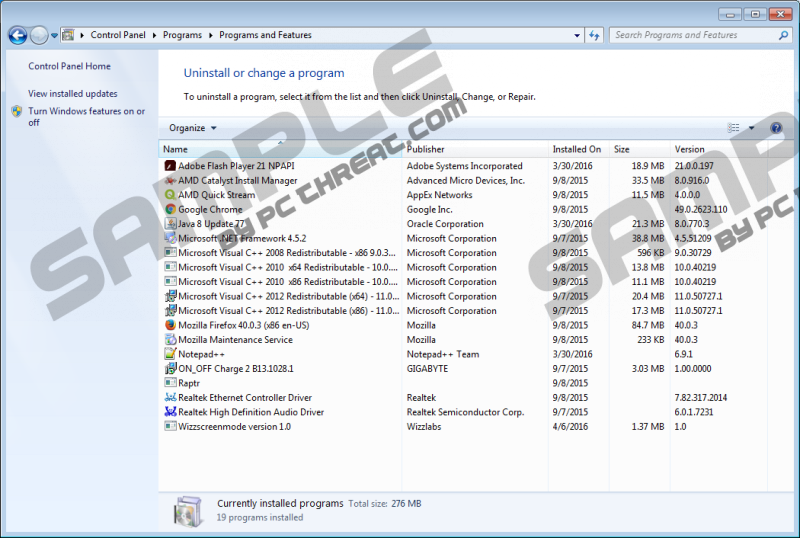 We have seen plenty of reliable installers carrying legitimate programs bundled together. However, we have also seen malicious installers that usually use one attractive app to expose users to malicious computer infections. Even legitimate applications could be exploited to hide malware, which is why you have to be careful not only about what kind of software you install but also about what kind of installers you use. The worst part is that malware is often infiltrated silently, and you might be unaware of dangerous threats running along with Wizzscreenmode. If you are not sure if malware hides within your PC, employ a malware scanner to inspect it. Have you detected unwanted programs or malware? If you have, eliminate them as soon as possible. LinqBridge.dll, unins000.dat, unins000.exe, and Wizzscreenmode.exe are the files you need to eliminate if you want to delete Wizzscreenmode. Additionally, you have to eliminate a RUN value called “Screenmoody.” If you do not think you can handle files, and you are not familiar with the Registry Editor, you can also try uninstalling this program. Of course, automatic removal is best, especially if other threats are active, in which case, you can have all malicious and unreliable programs erased from your PC simultaneously. As you now know, reliable programs can be introduced to you by malicious installers to infiltrate hidden malware. The same goes with anti-malware and antivirus software. You have to use authentic, reliable installers (check official download sites) to acquire genuine software without any additional threats. If you need help choosing the right security software, please comment below, and we will assist you as soon as possible. Tap Win+E simultaneously to launch Explorer. Enter %ProgramFiles(x86)% into the address bar and find the Wizzscreenmode folder. If this directory does not exist, or you cannot find the folder, check the %ProgramFiles% directory. Right-click and Delete this folder. Tap Win+R simultaneously to launch RUN and enter regedit.exe. In the Registry Editor navigate to HKCU\SOFTWARE\Wow6432Node\Microsoft\Windows\CurrentVersion\Run (or HKCU\Software\Microsoft\Windows\CurrentVersion\Run if you are on a 32-bit version). Right-click the value called Screenmoody and select Delete. Restart your computer and run a reliable malware scanner to see if other threats are active. Quick & tested solution for Wizzscreenmode removal.